I don't have the time, the patience or the skillset for complicated nail art. But you know what? Everything really is easier when you have the right tools. So I've gone a little bit dotty (see what I did there?!) 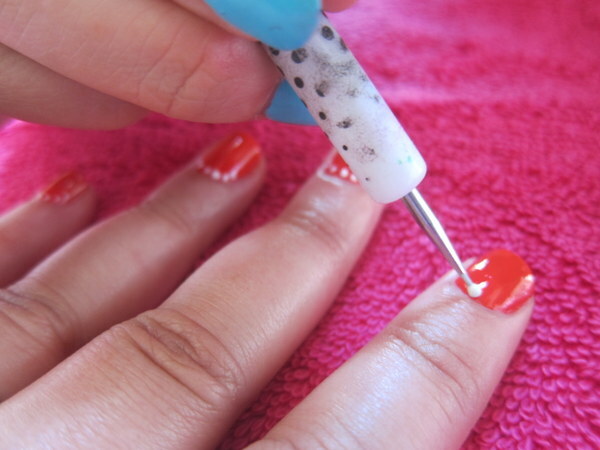 over this latest nail art tool from Bourjois. Perfect for precise application and all sorts of pretty patterns, this double-ended tool has one side for smaller and another for larger sized dots. It makes light and easy work of animal print, polka dot or floral patterns - and as many more as your imagination can possibly conjure up. 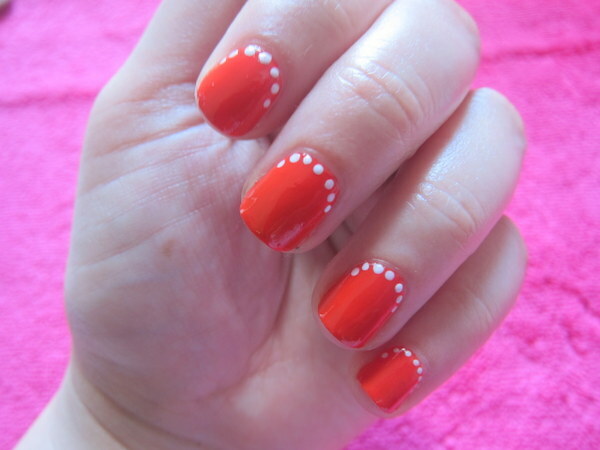 Here, I've gone for a single row of white dots over Bourjois Rouge Poppy - a gorgeous orangey red. Now this was professionally applied - but I'll be giving it a bash myself in the very near future. I'm not sure yet if this will be available in shops but you can buy online, for a very reasonable £3.99. Amazon are temporarily out of stock but should have more available soon. What do you reckon, would you be interested in giving it a whirl? I just use a bobby pin, then you can choose the colour nail varnish you want to apply the dots in, it's so simple! I had no idea that such utensils existed. Great tip! I love this idea, if I see one I will def get one, only 4 quid is a bargain! Wow, Bourjois seem to be on fire with their products lately! They are really coming out with some amazing stuff! Can't wait to try the pen! You did a great job Emma! Now you can even do different color dots. That would be pretty too. What a fun little tool! Very happy to see brands like this are launching nail art products, saw they have caviar beads out now too! This is cute! I use the Sally Hansen nail art pens and I love them! You are always head on with the coolest beauty stuff! I love your girlie nail art, it's so adorable! !